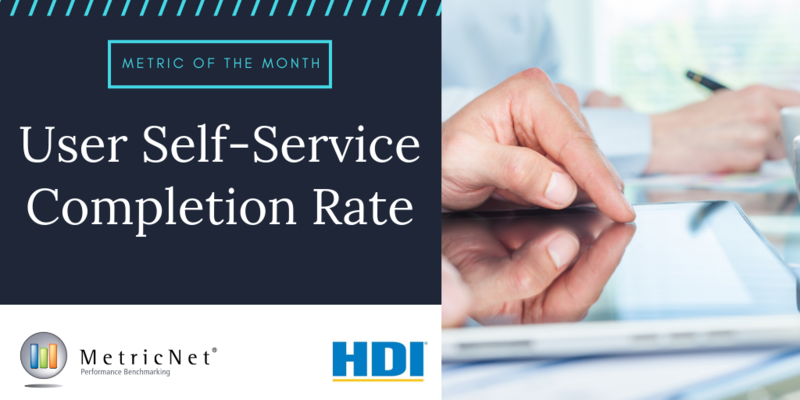 Each month MetricNet highlights one Key Performance Indicator for the Service Desk or Desktop Support. We define the KPI, provide recent benchmarking data for the metric, and discuss key correlations and cause/effect relationships for the metric. The purpose of this column is to familiarize you with the Key Performance Indicators that really matter to your support organization, and to provide actionable insight on how to leverage these KPI’s to improve your performance. Our most recent Metric of the Month articles can be found below. To access additional content, please visit the Metric of the Month Archives. An abandoned call is one where the caller hangs up before being connected to a live agent in the service desk. 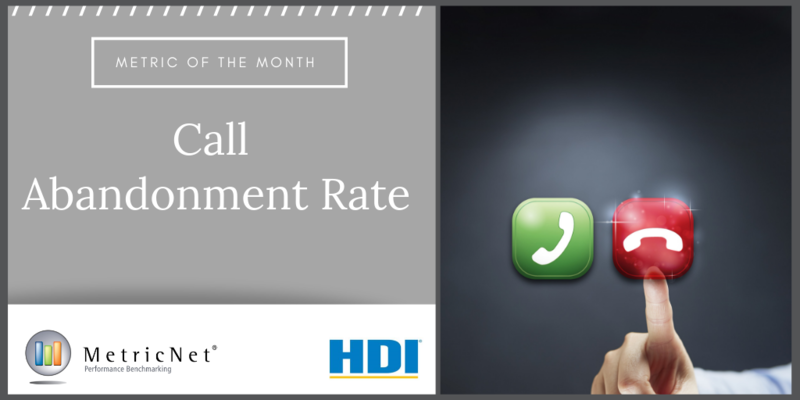 Call abandonment rate is the number of abandoned calls divided by all calls offered to the service desk and is one of the most widely tracked metrics in the service desk industry. Virtually every service desk with an ACD has the ability to track this metric. 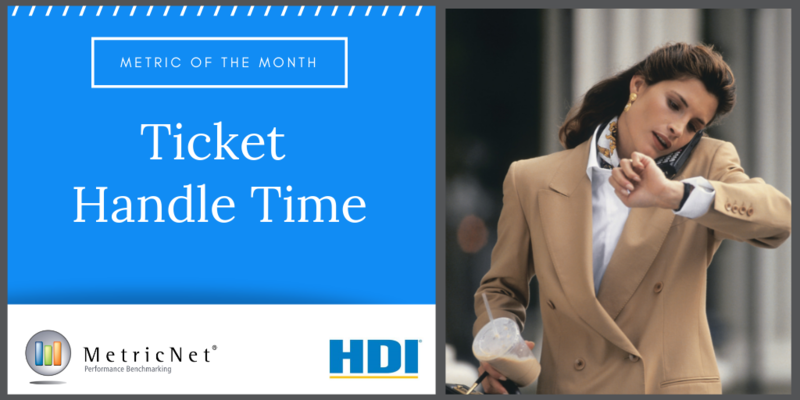 Ticket handle time is the average time that an agent spends on a service desk ticket, including talk time, chat time, wrap time, and after call or after chat work time (ACW). For non-live tickets, such as email and web submitted tickets, the ticket handle time is the average time that an agent spends working on the ticket before escalating or closing the ticket. 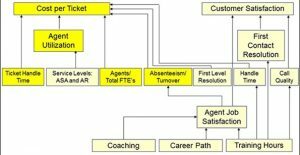 Service desk managers and supervisors frequently ask me about the proper ratio of agents to supervisors. Should it be 5 to 1? 10 to 1? 20 to 1? Like most KPIs, there are tradeoffs involved with this metric. 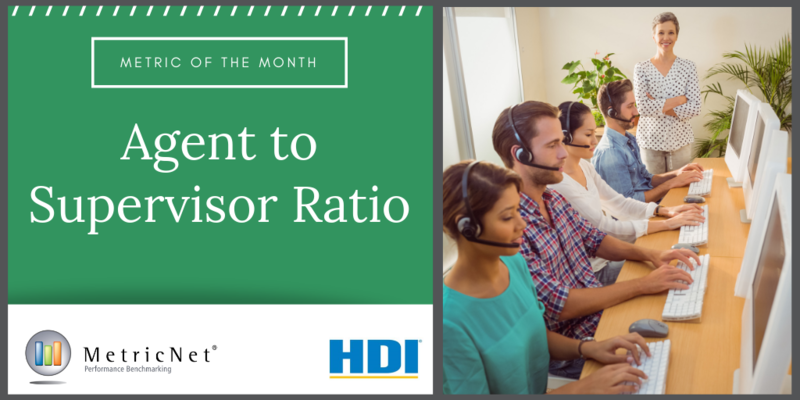 If the ratio is too high, the management span of control is too broad, and agents can be working without the proper level of oversight and supervision. This, in turn, can lead to a multitude of issues ranging from low morale to inadequate training, coaching, and feedback. 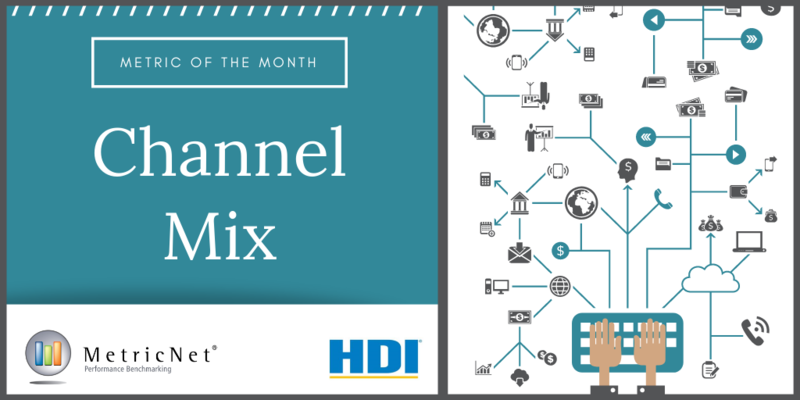 Channel mix at level 1 is rapidly evolving (illustrated in the figure below), and is considered one of the industry’s megatrends. In 2007 voice calls represented almost 80% of all ticket volume. Today, voice accounts for just over 50% of incoming ticket volume. There are two key drivers behind this trend. One is economic, and the second is demographic. User self-service measures the percentage of incidents that are self-resolved by the user, without the assistance of a live agent. 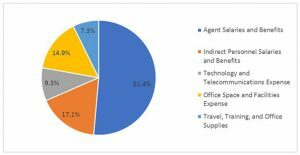 Let’s say, for example, that the agents on a particular service desk handle 4,000 incidents per month through voice, chat, and email. Another 1,000 incidents per month are resolved through user self-service (e.g., through a self-help portal that includes a password reset tool). For this hypothetical service desk, the self-service rate is 1,000 self-service incidents ÷ 5,000 total incidents = 20% user self-service. 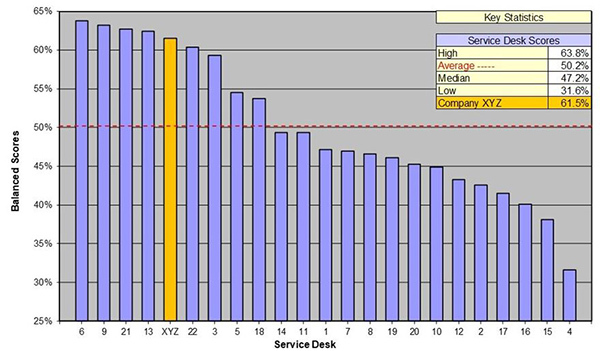 There are a number of ways to measure the efficiency of a service desk or desktop support group. 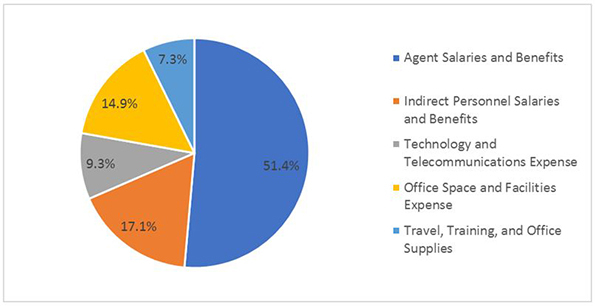 Metrics such as cost per ticket and agent utilization are the most common measures of efficiency. 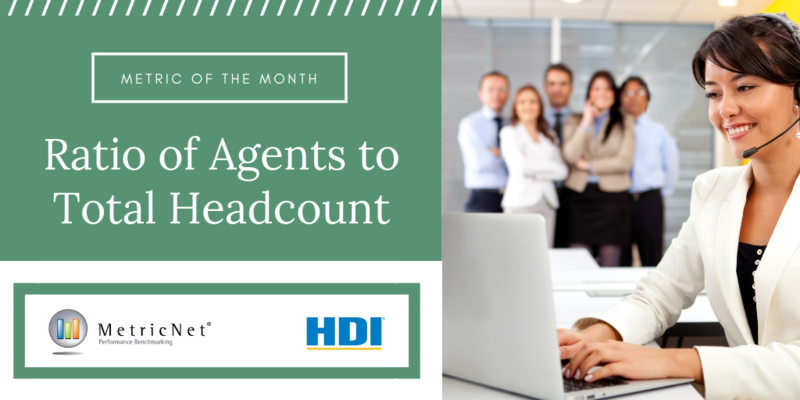 A less well-known metric that also drives cost per ticket is the ratio of agents to total headcount, and it applies equally to both service desk and desktop support groups. Some organizations make a distinction between good turnover and bad turnover. Bad turnover is when an agent leaves the company altogether because of performance issues or to pursue other job opportunities. 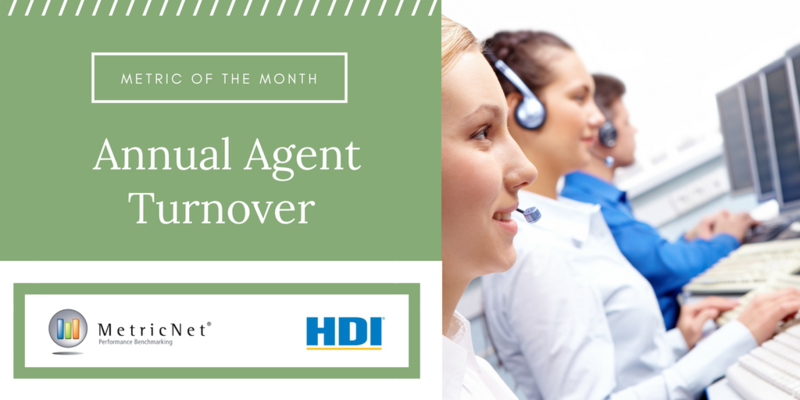 So-called good turnover, by contrast, is when an agent who is otherwise performing well is moved or promoted to a non-customer facing position in the service desk or accepts another position in the company that is outside of the service desk. Both types of turnover are included in the calculation of annual agent turnover because both types of turnover create a vacancy that must to be filled. The key to using KPIs diagnostically and prescriptively is to understand their cause-and-effect relationships. You can think of these relationships as a linkage where all of the KPIs are interconnected. 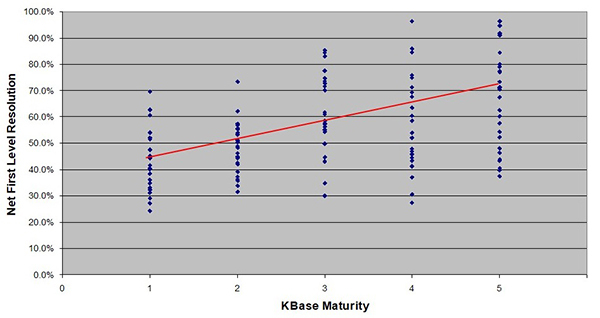 When one KPI moves up or down, other KPIs invariably move with it. Understanding this linkage is enormously powerful because it provides insight into the levers you can pull to affect continuous improvement and achieve desired outcomes. 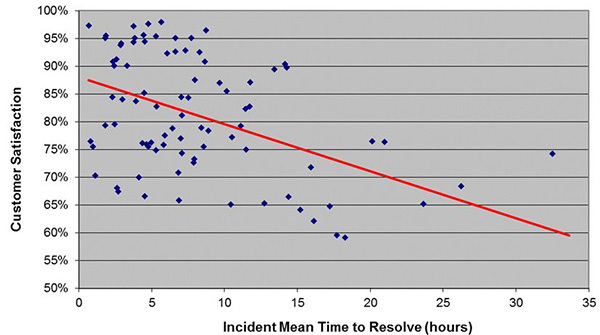 Incident mean time to resolve (MTTR) is a service level metric for both service desk and desktop support that measures the average elapsed time from when an incident is opened until the incident is closed. It is typically measured in business hours, not clock hours. An incident that is reported at 4:00 p.m. on a Friday and closed out at 4:00 p.m. the following Monday, for example, will have a resolution time of eight business hours, not 72 clock hours. Most ITSM systems can easily measure and track MTTR. 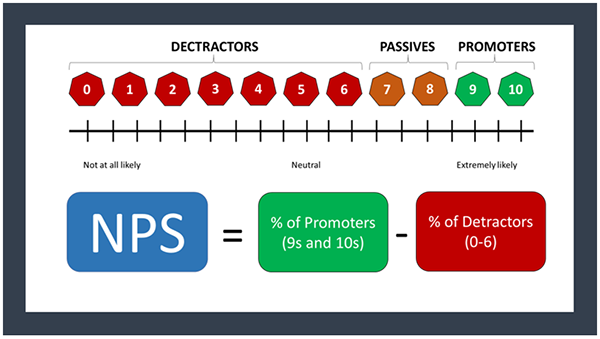 Net promoter score (NPS) is based on the idea that every organization’s customers can be divided into three categories: Promoters, Passives, and Detractors. By asking one question—How likely is it that you would recommend our service to a friend or colleague?—you can track these groups and get a clear measure of your support organization’s performance from the customer’s perspective. Percent resolved level 1 capable is a desktop support metric. It measures the percentage of tickets resolved by desktop support that could have been resolved by the level 1 service desk. This happens when the service desk dispatches or escalates a ticket to desktop support that could have been resolved by the service desk or when a user bypasses the service desk altogether and goes directly to desktop support for a resolution to their incident. 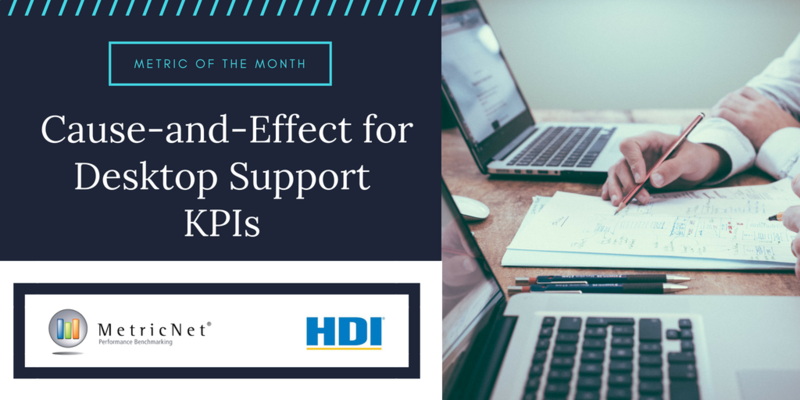 Although the metric is tracked at desktop support, it has strong implications for both desktop support and the service desk. Today’s service desk technologies and reporting packages make it easy to capture copious amounts of performance data. Most service desk managers can tell you everything from last month’s average speed of answer to yesterday’s average handle time. But what does it all mean? If my abandonment rate goes up, but my cost per ticket goes down, is that good or bad? Is my service desk performing better this month than it was last month? First level resolution (FLR) is a measure of a service desk’s ability to resolve tickets at Level 1, without having to escalate the ticket to Level 2 (Desktop Support), Level 3 (internal IT professionals in applications, networking, the data center, or elsewhere), field support, or vendor support. FLR is not to be confused with its close cousin, first contact resolution. Cost per ticket, along with customer satisfaction, are often referred to as the foundation metrics in desktop support. They are the two most important metrics because ultimately everything boils down to cost containment (as measured by cost per ticket) and quality of service (as measured by customer satisfaction). In any service delivery organization, cost, or more accurately unit cost, is critically important. Cost per ticket is a measure of how efficiently desktop support conducts its business. 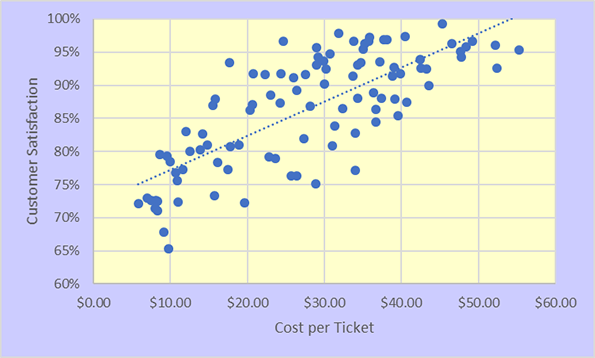 A higher than average cost per ticket is not necessarily a bad thing, particularly if accompanied by higher than average quality levels and lower mean times to resolve. Customer satisfaction is top-of-mind for virtually every service organization. and for good reason: it is the single most important measure of quality for a service desk or desktop support group. 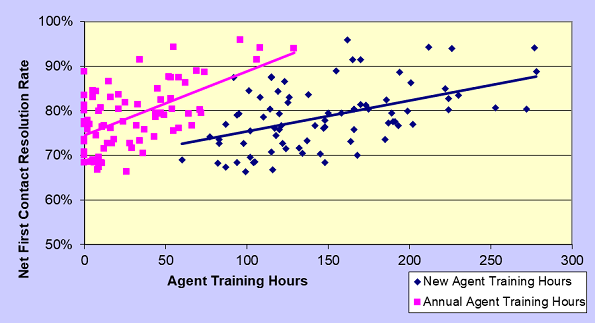 But what about agent job satisfaction? How important is that, and why don’t more service desks track this metric? It turns out that it’s plenty important, and every support organization should track and trend this metric on an ongoing basis. One goal of every business is to achieve the highest possible quality at the lowest possible cost. It stands to reason, therefore, that cost and quality should be measured on an ongoing basis. In fact, many would argue that cost and quality are the only two things that really matter in a service desk. In past articles, I’ve discussed the importance of using metrics as a diagnostic tool to improve performance. So, we must ask ourselves, if cost per ticket is one of the foundation metrics for the service desk, how can we affect it? How can we improve it? What are the primary levers we have to manage cost? Customers tend to be impatient when they want service. It doesn’t matter if they are calling their bank, their cable company, or their service desk. They want a resolution to their problem or an answer to their question right then and there! In fact, research across many different industries bears this out. Customer satisfaction—for virtually any type of customer service—is strongly correlated with FCR! Customer satisfaction is by far the most common measure of quality. It is widely used, not just in IT service and support, but in all industries. It is so ubiquitous that most of us have probably been surveyed within the last week, by our bank, an airline, our insurance company, a hotel, or some other service provider. The metric is so common, that most have an intuitive feel for customer satisfaction. We know, for example, that a customer satisfaction rating of 70% is probably not very good, while a customer satisfaction score of greater than 90% is very good indeed! 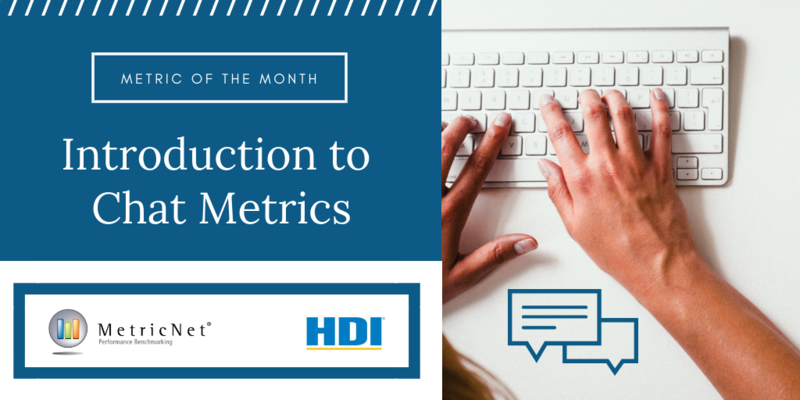 In this Metric of the Month, instead of discussing a single metric, I will explore the cause-and-effect relationships for service desk KPIs. This will give us an overarching framework and roadmap for discussing future KPIs in this column. Cost per unit is a common metric throughout our economy. Many of you know the cost of a gallon of gas, or the cost for a cup of coffee, or the cost of a movie ticket. Yet surprisingly, many service and support managers do not know their own cost per ticket.